This is the patch that everyone thought that wouldn't happen, but here it is. Becase we had to move from numbered scripts to named scripts, if you had a previous version of AEoD set up, you'll have to set up again the keybindings. This only affects AEoD's in particular, such as the weapon dropping and slot limits. Themes rewritten: You can now select the monsters per game that you want to spawn. Want only doom monsters? No problem. Quake 2 + Hexen? There you go. You choose! Zombies everywhere: You can now enable directors in any and all modes/themes you select. So, if you want, you can have your lovely bunch of zombies spawning everywhere. Directors are directing your game: If you're not into zombies, you can select another director to spawn monsters according to the theme(s) and monster selection(s) you're playing. One new weapon: It might be only one, but if you get it, you can be sure it'll be quite useful for the rest of the game. One new joke mode enemy: Well, that'll take time to be found. Brand new power up: Might want to check the video below. Spellbooks all around: You never found spells before? well, that has changed now. And their effects have been amplified too. If you're upgrading from 6.02 to 6.06, you don't need to redownload the main package again; all you'll need is the coding package. That will suffice. And remember. You need both files. New patch is up. But is no simple patch. See the readme for the changelog of the bugfixes. What's important here, is what's new in it. Is a brand new mode where you get the portal gun right at the beginning of the game. -Player gets the portal gun, but no other weapon when the game starts. of course, to grant some protection. previous level, except the earth symbol, pentagram, medkits and life urns. or just cycle through the weapons in slot 1, and get your prize. So, the idea is to finish the game as fast as you can. Simple, huh? Well, it is. But, turns out, that this is a little contest. Players have up until February 18th 11:59 PM (GTM - 6:00) to upload their videos running through Doom2. On February 19th, at 10pm central time, the winners will be announced, and they get to pick their prize. -Player will have to record the whole thing from start to finish. It doesnt take that long. If they cant upload it in one piece, upload it in as many videos as needed, but without any special video editing. -Player can play in the easiest skill. -No fancy video editing of any sort. Plain and simple video showing how he managed to get past through doom2. -Player cannot deactivate the Weapon Slot Limit system. -Map 31 and 32 should not be played. -Once finishing map30, player must let the game show all the stats. Once the video is submitted, we'll watch the whole thing, and at the end of map 30, we'll see what the internal game clock says. The lenght of the youtube video will not be taken into account, just the game clock. What are the prizes? Well, games. There will be of course, 1st, 2nd and 3rd place. First place decides what game he wants. Second place chooses after that, and third place at the end. Games will be delivered through Steam. So, an steam account is needed to claim the game. If we dont get more than 3 entries, then those 3 people win. Isnt that nice? Well, two people actually participated and therefore, both of them win. First place with a time of 18:17: krokots. Second place with a time of 21:47: eaglemf. Thanks for participating, and enjoy the prizes! An experimental addon that should help a good deal with performance. All generic explosions have had the default amount of particles reduced, as well as added sight checks. If spawned out of sight, the particle count is reduced almost down to 1 particle for the smaller ones, while the larger ones still spawn a few just in case the player catches sight of it after it spawns. Flying debris duration cut down, and chances to spawn debris reduced. Blood persists through frozen time, allowing for the player to freeze time and help get rid of some effects while in heavy fighting. Gibs disappear very quickly once they stop making trails. And 6 years later, AEons of Death comes in it's 6th version. Every version has tried to do something, if not new, at least different; or in the worst case, something bigger. Not for the sake of being big. For the sake of variety. Someone once said "just to see the guns and point and click them at different pictures". Well, we love to have a ton of pictures to shoot at. Whether it is just adding new weapons, or adding dynamic lights to almost every projectile, or adding new effects, or adding damage types and damage resistance to all monsters, each version has tried something new in the AEoD's book. And the 6th version of AEoD is no exception. The all so loved and hated uber randomizer mod. Random monsters. Random weapons. What else? New weapons: You cant reinvent the wheel. But you sure can fancy it up. New monsters: And perhaps add more little decorations to said wheel. New spell system: Because changing weapons to bring the spellbook, cycling through it's pages for the right spell and then switching back to the weapon you were using after the spell was cast, wasnt exactly practical, now you can cycle through the spells in the HUD and fire the one you want whenever you want. New nightmare skill: Tired of having those same monsters respawning every X seconds? Well, this time it wont work like that. Is it harder? Maybe. Is it more fun? We certainly think so. Themes / Games : Having a dozen of games mashed into a single mod was always the idea. But what if you wanted to use all the same arsenal, but this time, say, against the Hexen 2 monsters? Have you ever thought that the second episode of Scythe 2 would work wonderfully with those Powerslave monsters? What about playing Requiem.wad with Strife monsters, just for the sake of it? Well. Now you can. Remember. You need both files. So, hopefully this will be the last "patch" to get rid of the issues that kept coming up. This one focuses on fixing the issue with the "drop weapon" confusion all around, and to make player classes selectable once more. It might not be elegant, but at least now you can choose your class again (no longer from the player setup screen, since Graf made clear that it shouldnt have worked like that for single player). Is a good thing to know. Reallly the changelog is quite small for 5.29. Still, this file is recommended to download. v5.29.1 is only a quick fix to a somehow overlooked, but very important issue that appeared with v5.29. Get the patch v5.29.1 here! Remember you need the main AEoD package too, otherwise the mod wont work just with the file above.. Download the AEoD main package here. Go and get the new patch HERE. Included you'll find the readme for this patch. You should give it a read. Basically, after several months of playing, testing and some feedback, we're releasing a patch that addresses most issues (especially the critical ones) and brings a couple changes aswell. That's right, now monsters are dynamically affected by the type of weapon you're using. Likewise, monster's attacks have types, so, take advantage of infight. So, for example, if you attack a fire monster with fire, it'll take only 50% of damage, or an undead monster with magic (i.e. dragon claws) it'll take 25% more. However, there are no lists showing the damage classifications per monster or weapon, so, it's up to you to find that out through experience. Have a look at the playlist right here! 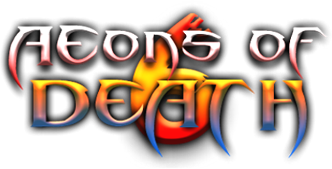 Æons of Death is a massive compilation wad that brings together monsters, weapons, and items from numerous games, such as Heretic, Hexen, Quake, Quake 2, Redneck rampage, Duke Nukem, Blood, etc. The mod uses a randomization code which causes any monster or weapon in a certain class to spawn a random monster or weapon respectively. For example, in place of an imp, a snake imp, or a kilmaat, or a catharsi, or one of several others might appear. Also, in place of a shotgun, a shotgun from Doom 3 or the Arc of Death from Hexen might appear. This guarantees that it will never be the same game twice. Monsters might also drop weapons, ammo, health, or items such as bottles of medicine, artifacts, or runes which can also be stored in the inventory for later use. To run this extra packs just add them into the end of the command line. Check info below. Simply put: a collection of midis playing randomly per map. This one basically cuts some of the effects spawning on the mod, improving performance. This extra pk3 is optional, and should be used if the explosions causes your game to lag too much. IMPORTANT: This mod requires Zdoom v2.5. You can find it here. The mod will not work in Skulltag or another Zdoom child port besides GZDoom (v1.5). Alternatively, in both cases, you can make a shortcut to (g)zdoom.exe and in the properties->Shortcut->Target add the two pk3 file names (and the custom wad, if any). Like shown in this video. Scanner - When picked up, it will not only display the whole map, but all of the enemy locations as well. Force Cube - Use this and a floating cube will appear in front of you and attack anything nearby. Can use up to two at once. Ice Shield - When you use this, the air around you will become bitterly cold, freezing anything that comes close to you. Fear Rune - Most enemies will run away from you. Drain Rune - Use this and every time you damage an enemy, that damage is transferred to you as health. Invisibility Rune - You become partially invisible, making it harder for enemies to target you. Fire Symbol - Your weapons will do more damage. It doesn't last long though, so make the most of it. Stone of Temperance - Grants you immunity to ripping damage (projectiles don't pass through) and most explosion damage. It also makes enemy projectiles unable to home in on you. And on top of that, you get some damage reduction. AntiChickenator - If you ever get turned into a chicken, this will change you back. Using this any other time will give you protection from being turned into a chicken. There's also a little bit of damage reduction thrown in. Icon of Summoning - Throw this on the ground and you will summon a Heresiarch to attack enemies for a short time. Red Mine - Once thrown, it will sit there and explode whenever an enemy comes too close. Picking one up will give you 5 mines. They can also be carried between maps. Gold Mine - Like the red mine, except this will actively seek after an enemy before exploding. Picking one up will give you 3 mines. They can also be carried between maps. Diabolical Dice - Roll this and a random effect will occur. It can be good, or it can be bad. You can carry up to three dice, which can also be carried between maps. The effects differ depending on how many dice you have when you use them. -Changed 'Health Bottle' to 'Medikit' in the configure controls options. Have fun! And dont forget to report if you find any anomalies. Last edited by DBThanatos on Mon Mar 14, 2016 10:04 pm, edited 75 times in total. yes, a new patch! finnaly! hey Thantos, you fixed the nailgun? If I install the new patch, will my saves work or do I have to start over? No, they won't work, you have to start all over again if you install the new patch. Wow, that's a hella lot of things fixed, but I didn't see the Korax issue addressed as fixed in the changelog; is he fixed, or is he still attacking all the kekking time, even though I'm standing right in front of him? Last edited by Princess Viscra Maelstrom on Wed Apr 27, 2011 3:29 am, edited 2 times in total. Screenshots 5, 14 and 17...which maps are those?? I'd like to play those with the mod. and the video with the city map, what is it? i want to get it. X-CrAzYkOoL-X wrote: and the video with the city map, what is it? i want to get it. You can get it here and it's map 09. Okay, this is weird, I keep getting a bunch of errors. It loads and all that, but I get a boat load of errors about unknown class. Did it get corrupted somehow? I'll download it again. This weird. Errors like unknown class minirocketbox. Well, so far it seems to be running. But even after I downloaded it again, it still gives me these errors. I even upgraded to the newest Zdoom SVN and I still get tons of errors. What the hell is going on here? I also see a lot of errors like unknown class 0, about 150 of them, and a couple of unknown class null, and a unknown class zzzzz. Unknown class bishopsmoke, skeletonspawnersmoke, superimpclaw, etc. This is weird. I mean, it still runs, but it's like the files have been corrupted. Oh, great, now even autoaim is broken! Even at 5000, or always, I never autoaim. This is great! Even more of a challenge. also, a bad thing. Last edited by DavidB1000 on Sat Jan 17, 2009 3:47 pm, edited 2 times in total. DavidB1000 wrote: Okay, this is weird, I keep getting a bunch of errors. It loads and all that, but I get a boat load of errors about unknown class. Is Autoaim broken for you as well? Because it doesn't work for me at all. I never use autoaim so i wouldn't know. I don't see the Chaos Spellbook in the 4.21 changelog so I assume it didn't make it into this patch. Ah well, so far I'm liking the fixes. Also I seem to be getting more varied boss monsters now...maybe I'm on a lucky roll Oh and I finally picked up teh Heavy Rocket Launcher...wow that thing is awesome.